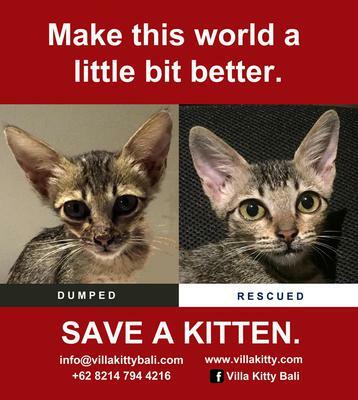 Villa Kitty is a rescue and adoption center for Bali's abandoned cats and kittens. We have just celebrated our 3rd birthday with one hundred and twenty-one cats and kittens, seventeen of them tiny kittens under 6 weeks having arrived in the past seven days. Please consider adopting or fostering, and if you are not able to adopt or foster please consider making a donation via our PayPal account or volunteering. Visit the website of Villa Kitty Bali or the Facebook page.